Never one to miss an opportunity to meet someone new, I had the chance to meet Judy’s granddaughter, Lana, the other day. She’s a charming, soft-spoken and an incredibly poised young lady who graciously interrupted her drawing (she’s very artistic) to speak with me. Since she often spends time in the JLD design studio, I asked her to describe what she thought her grandmother, (whom she calls LuLu), does for a living. “She goes into people’s houses and makes them comfortable.” Well, that pretty much sums up exactly what Judy and her team do. They create homes that people love to spend time in. What do you think is her favorite part of her job? “Lulu loves to sketch what she’ll do with the homes.” If you’ve ever met Judy, she’s never not looking for a pen or pencil to sketch something. We find them everywhere, like little gems. I asked Lana if she’d ever thought that she would like to design someday. It seems that she’s always thought about designing a tree house. “It would have pillows and blankets that would make it a cozy and comfortable place to read. Lots of warm yellow light. Decorated in light blue.” Seriously, I want a tree house now. Her other special room is her bedroom and she loves her crystal collection: amethyst, black tourmaline, and more. “I love the formation of the crystals.” Truth be told, I thought she’d say she liked the pretty colors – silly me. Well, I think this young lady speaks for most people when she says she wants cozy and comfortable. We all seek comfort in our homes. When we open the door at the end of the day, who doesn’t love that welcoming feeling, a feeling that we belong in the space. I couldn’t resist asking Judy how her granddaughter has inspired her. Judy has enjoyed every age of Lana’s life – from precious baby to the accomplished young lady she’s become – yes, that’s her playing the piano. Inspiration can come from anywhere. 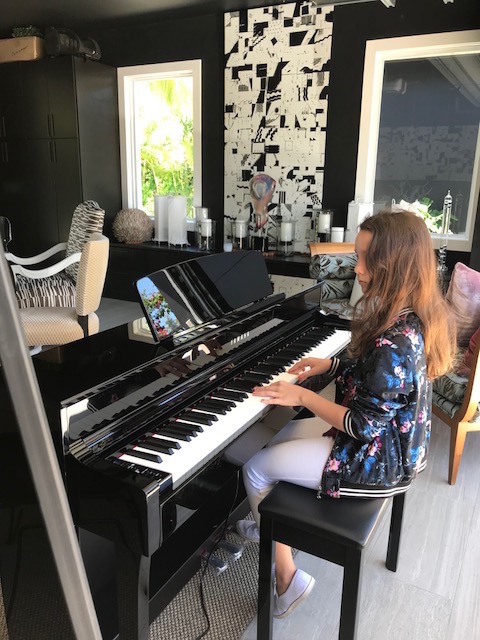 It can come from books, coaches, meetings, and sometimes it’s right in front of you practicing on the piano….